There are several things you will notice that differentiate surf caught bream from their river, creek and other still water brethren and that is their colour and shape. Bright silver bream that are longer and slimmer than the dark olive bronze colouration found on estuary caught fish. Their habitat is changed also, no oyster encrusted cover to hide in here, deep holes and gutters covered by varying amounts of white water close by banks and prowling the shore break only metres from the beach is the hunting ground for these shining predators. Pippis, yabbies, hardiheads, and other small whole baitfish are the food source here as well as fresh cut flesh baits. Locally caught and collected baits being best. 3kg to 6 kg line matched with No 1 to 2/0 hooks will be required to target what is on average usually a larger class of fish and other larger species that will be encountered. Traces of 45cm to a metre allow the bait to waft around above a pea size to 7 ball sinker depending on surf and wash conditions. 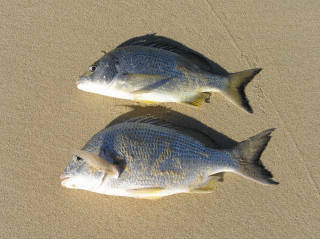 Light to medium surf rods are a good choice, with surf bream biting well at times regardless of the time of day. Freshly caught silver bream from the surf beach are clean and mean. In some of our now polluted water ways, bream can be a very questionable addition to the table. Surf bream on the other hand look good and taste even better. Firm white flesh with a little squeezed lemon is simple and will have you back looking to catch more.